FC Goa striker Manvir Singh has come into the media highlights recently after Stephen Constantine picked him over many big faces in his National side to face Mauritius. 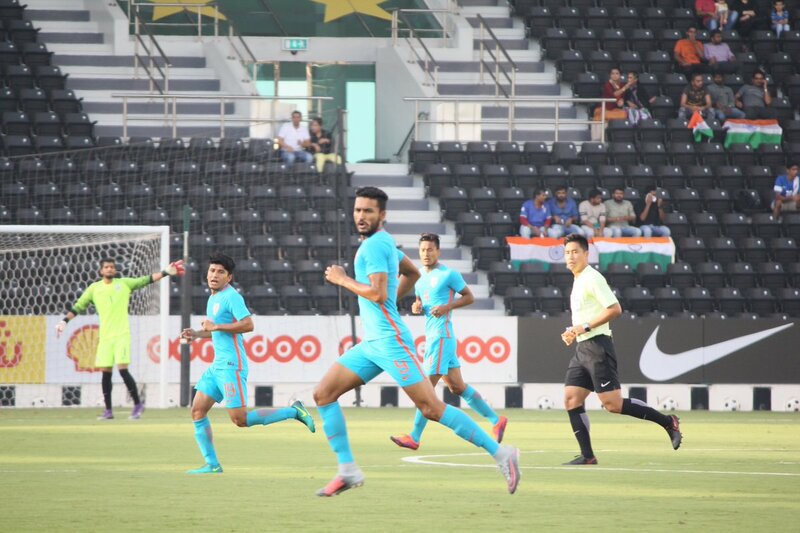 Soon after, Manvir was picked up for the AFC U-23 Championship Qualifiers, before FC Goa swooped him in for the afoot Indian Super League season. The punjabi prodigy is one of the most promising forwards in India currently, who’s glittered West Bengal by scoring the 119th minute screamer to win his side their 32nd Santosh Trophy last season. An avid fan of Real Madrid’s Cristiano Ronaldo, one can easily find the reflection of the Portuguese in Manvir’s game. The true find of Stephan Constantine, Manvir idolises Indian National Captain Sunil Chhetri and is confident that one day he’ll fill the boots of the legendary striker. Manvir, you’ve played league in three different cities. You have seen the transition from the National Team to U-23 and now ISL, and everything that has to come in between. How would you name your journey so far? How has the Indian footballer’s life changed since then? I have played in Punjab, then Kolkata and now in Goa and to be very honest the journey has been nothing but incredible. I have learnt a lot with every coach I have played under and there’s still a lot more to learn. Life has changed a lot, as it has become very professional. Players at a young age understands the importance of right diet, sleep, training and so much more. One thing that has happened since Stephen Constantine took the reins of the National side is that he has handed a debut to over 30 players, and you are one of them. Your say? Stephen sir has been phenomenal for the Indian football and he has given hope to every footballer. Now any player playing in any league can dream of playing for the country should he perform well. It is very good for any National football side when the national team coach has a bigger pool to pick from and at the same time it keeps each and every player on his toe to perform at his very best. FC Goa is doing well in this session. As they lost in Delhi last year 5-1 and this time it was surprisingly disastrous for them. What are the changes in game play and team has done and what are the extra steps incorporated? Our coach Mr. Lobero knows exactly what he wants from each and every player and every player wants to give his 100% for the team. FC Goa has the right combination of Indian and foreign players. Everyone is working really hard from team management to the players. We have one of the best fans In the country and in every game we try to give them something they can cheer and feel proud about. From Black Panthers to be calling yourself as a Gaur, and debuting for National Team, everything has apparently changed after that winner goal for Bengal in the Santosh trophy finale. How you are adapting to becoming a leader? It has been smooth and big thanks to my team and the management. Life of a footballer is such, one city to another, one team to other. We learn to adapt to new teams and city, though our dreams remain the same. Manvir, growing up which Indian footballer did you idolise and how supportive were your parents in taking football as a career, given the fact that he has also played for India and that he knows the controllable facts? My parents have always been very supportive and my father being a professional footballer himself, has never controlled by decisions as he rather works on improving my game and thought process. My father is my idol. I have always looked up to him and in the current players, my idol is our captain Sunil Chhetri paaji. A longer and more focused on Indian player ISL is something that has drawn widespread praise. From a player perspective, how do you think has it helped? It grants more opportunities to Indian players and like I said, it’s always good for any country’s national team when they have a bigger pool of players to choose from. Longer league is always better as it gives better competition and the calendar is not too cramped up, which gives more recovery time and eventually decrease in number of injuries. Is Manvir Singh among the Best Strikers in India?